The growth of Florida’s craft beer industry has created new opportunities for Florida growers to establish commercial hop (Humulus lupulus) operations. However, many challenges including several nematode species make the establishment of this industry difficult. 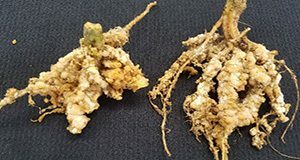 This 4-page fact sheet written by Johan Desaeger and published by the UF/IFAS Department of Entomology and Nematology describes nematodes that prey on hops and suggests some strategies for preventing nematode damage to safeguard this emerging industry.